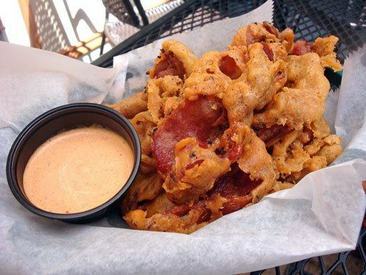 Thick cut applewood bacon is coated in a hearty beer batter, fried until said batter reaches a rich mahogany, and finished with a generous cracking of black pepper. The accompanying chipotle mayo is gratuitous, but its spicy kick is addictive nonetheless. The bacon is fried long enough for the fat to render out, but not so much that the strips shatter under your teeth. If you like your bacon chewy, you'll be thrilled with this dish. And even if you don't, ordering it will create a welcome diversion if someone in your party tries to convince everyone else to order the 5 lb. Bacon Bomb.